Naval Assault The Killing Tide is a totally enjoyable and extremely brilliant new game from 505 Games which sees players leading their ocean fleet into battle against their sworn enemies. The game is extremely captivating and addictive and will certainly bring out the competitive edge in all players. Brilliant game all round and would recommend. 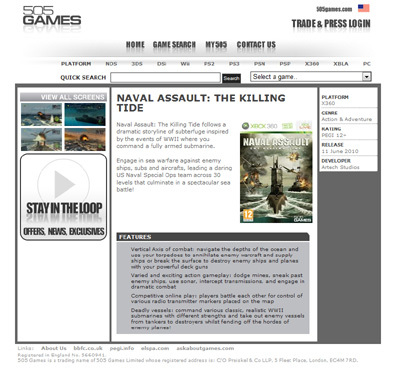 We have also compiled a Review System for this, of which Naval Assault The Killing Tide is Rated as Five Stars, the highest possible score available from the Game Review Team.